With the recent election of Mayor Ron Nirenberg and six new council members, San Antonio is much better positioned now than it was a few months ago to take a leadership role in combating climate change. At its first meeting, the newly sworn in council adopted a resolution committing to reducing greenhouse gas emissions and adopting the goals the U.S. set in the Paris Climate Accord under President Obama. As a result, Mayor Nirenberg added his name to a pledge from over 350 U.S. mayors in the Climate Mayors association, stating their commitment to climate action, even though President Trump has committed to remove the U.S. from the agreement. 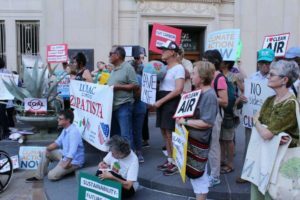 Local action to reduce greenhouse gas emission is more important than ever, both to compensate for the U.S. withdrawal from the Paris Climate Accord, and because the climate crisis is becoming more and more urgent all the time. A majority of Americans live in cities, and cities – especially large cities like San Antonio – have the ability to directly control or influence systems that are responsible for significant greenhouse gas emissions. Cities have control over energy codes for buildings, local transportation planning, land use plans, and waste collection. And some cities – including San Antonio – have the added benefit of owning their own municipal electric utilities. San Antonio has taken the first step of publicly committing to take action to reduce greenhouse gas emissions and help the U.S. meet the commitment it made to the rest of the world. The next step is to set specific goals for greenhouse gas reductions and develop a plan to make that possible. Because there is a lot of infrastructure that isn’t controlled by cities that will continue driving up greenhouse gas emissions under Trump’s industry-friendly policies, cities are going to have to be very aggressive to keep the U.S. as a whole on track to meet its Paris goals. Even before Trumps election, cities have been adopting aggressive greenhouse gas reduction goals and plans to meet those goals. In 2014, the Austin City Council adopted a goal for the entire Austin community to reach net zero greenhouse gas emissions by 2050 or sooner, if possible. Now is the time for the San Antonio City Council to keep up the momentum by adopting an aggressive greenhouse gas reduction goal for the community and starting the process of developing a climate action plan to achieve the adopted goal. Given that San Antonio controls the electric utility that serves the city, a net zero greenhouse gas goal should be given strong consideration. Both adequate funding and a framework that will allow broad and meaningful community participation in development of the plan will be important.